Pop Goes the Library: Using Pop Culture To Connect With Your Whole Community (aka "the book" aka "Pop The Book") is a real book. 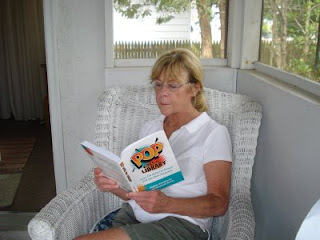 One of our ideas: get caught reading Pop and share the photo with us! Details are at Flickr. The official publication date is August 11, but of course, you (or your library) can pre-order the book anytime directly from our publisher. It's also available from the usual suspects. In the meanwhile, the blogging about the book will be taking place at the Book Blog. Yes, another blog to add to your reading! Oh, YAY! You guys, it looks GREAT! What an absolute thrill! Congratulations!! !